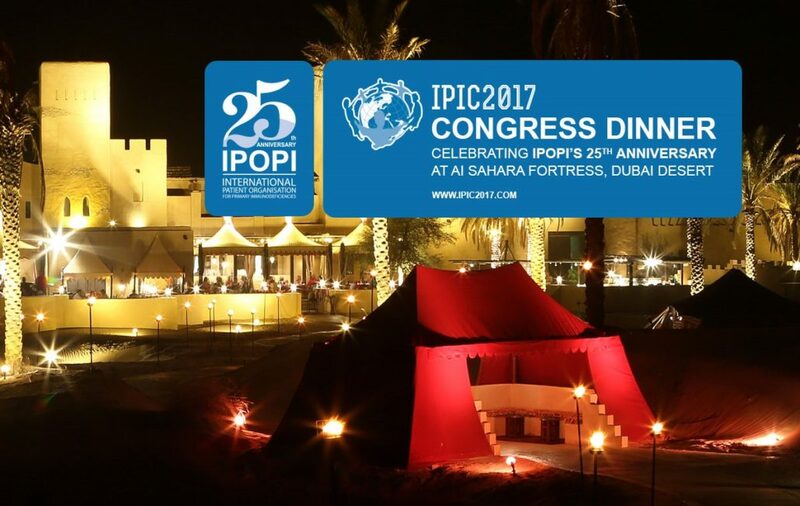 IPOPI is celebrating its 25th Anniversary this year and we are pleased to commemorate this milestone at our upcoming congress – IPIC2017 – during the congress dinner on November 9! The congress dinner will take place at the Al Sahara Fortress, a unique venue in a nature reserve in the Dubai desert, just a 25 minutes’ drive from the iconic Burj Khalifa tower. Congress dinner guests will enjoy a traditional dining experience in Bedouin style and live Arabian entertainment. The Al Sahara Fortress has a souk (Arab market) as well as camel and falcon shows. Bus transportation from and to the congress venue will be provided to all dinner attendees. IPOPI is grateful to many people and many organisations who have been part of IPOPI’s success story. Since its inception, IPOPI has grown tremendously. Eight years ago, IPOPI had 30 national member organisations, nowadays we represent 61 patient groups from across the world and the family keeps growing. A lot has been accomplished but there is still a lot be done, not only for patients but with their involvement. IPOPI is extremely busy in all regions of the world, greatly contributing to increasing awareness of primary immunodeficiencies globally. 2003 – Immunoglobulins are removed from the World Health Organization (WHO) List of Essential Medicines (EML). 2005 – David Watters becomes IPOPI Executive Director. 2006 – IPOPI’s European PID Consensus Conference in 2006 in Langen, Germany). 2007 – Immunoglobulins are reinstated in the World Health Organization (WHO) List of Essential Medicines (EML) following IPOPI/ International Union of Immunological Societies (IUIS) joint campaign in collaboration with key stakeholders. 2007 – IPOPI is accepted as a member of the WHO Global Collaboration on Blood Safety. 2010 – IPOPI expands its staff. Johan Prevot joins as Director of Development, succeeding to David Watters in the following year as Executive Director. 2011 – First IPOPI EU PID Forum is held. SCID newborn screening is discussed at the European Parliament. 2011 – IPOPI reaches 30 national member organisations. 2012 – Asian development plan is created thank to a generous grant from one of IPOPI’s founders, Bob LeBien. 2015 – IPIC2015 takes place in Budapest, Hungary, with 700 participants. 2016 – IPOPI reaches 60 National Member Organisations. Several PID awareness and advocacy campaigns in various regions of the world.